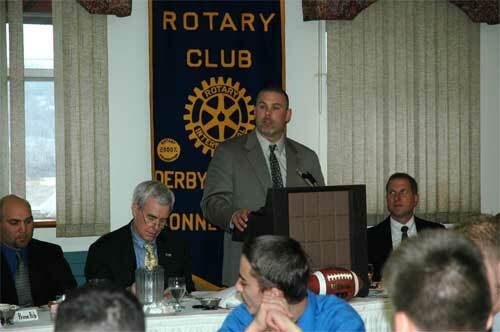 Derby/Shelton Rotary Club President Pat Tarasovic is pictured with Derby Mayor Marc Garofalo (L), the captains, guest speakers and coaches for the Derby & Shelton High School Football teams at the annual football luncheon. 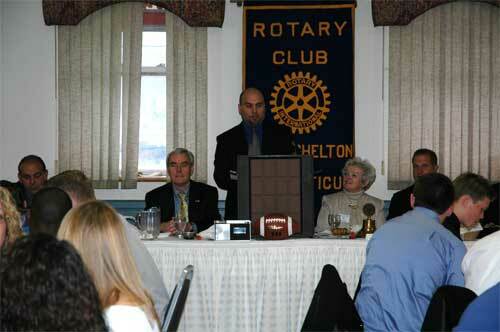 Each year at the annual Derby/Shelton Rotary Club Thanksgiving Day Luncheon, the two schools are invited to bring along an alumnus who played in the Thanksgiving Day football game. The invited guests are the main speakers at the luncheon. This year Derby brought along graduate Tony Peccerillo who was a quarterback during his high school days and now works for a software firm in Norwalk. Ken Roberts was the Shelton speaker. Ken was a linebacker in Shelton and now serves as the head football coach at Newtown High School when not running two business in Shelton that he owns. The speakers inspired the entire audience with their own personal memories of the game and the role that the game and playing football played in their lives. The luncheon is a long standing tradition that the Rotary Club has carried on for decades though there have been luncheons of one sort or another since the 1920’s. The two teams also had an opportunity to see the Derby/Shelton Rotary Club Trophy which goes to the winner of the game to keep for one year. The first team to win ten games gets to keep the trophy permanently. The competition for the trophy dates back to the 1930’s when the Shelton Looms first donated a similar trophy. 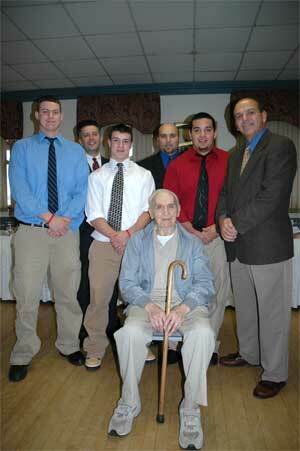 One of the guests at the luncheon this year was Myron Horbal. Mr. Horbal is a graduate of the Derby High School Class of 1927!